Billie Espejo is a Research Assistant at AgBiome, currently working on microbial collection expansion. She received her B.S. in Environmental Systems from North Carolina State University in 2013. 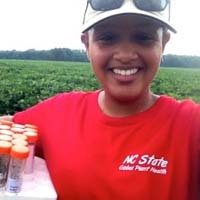 Prior to joining AgBiome, Billie was an Undergraduate Research Assistant at North Carolina State University working with Meloidogyne spp. and Agrobacterium-mediated transformations.